Recently, my wife posted a list on the side of the fridge. It simply stated "To Do in 2010". Some of items were doable, others I consider a stretch goal to get done. These are items like "Clean upstairs closet" which I'm sure through the mountains of old clothes and an assortment of items likely lead to pine trees and then Narnia at some point. I must say, the list gives me direction and clarity. If something is on a list, I attack it. I like the sense of crossing things off my list. This is why I like planned running. It is my list of daily dose of running to get me to my longer goals. What do I have to do today to get to my running goal? Don't get this confused that running becomes a daily task for me, it isn't, it is a great escape - a self induced running high like no other. However, knowing I got in a run for the day allows me to cross at least one item on my DTL (Daily Task List). January was a great month for me. 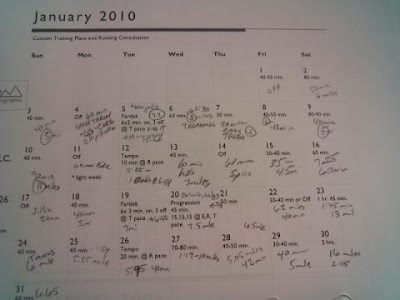 After coming back from injury, I was able to cross off runs on my calender basically exactly as planned. Here is my printed customized plan (Thanks to Zach at summitrunnercoach.com) and my handwritten notes. Spring Online Nutrition Boot Camps THIS week! Not too late… Register Today (look under Nutrition Plans ^)!!! I am a regular guy who is married, has two active boys, a 40 hr week job, and like to run. Okay, I like to run a lot.